I saw this on Food52 and was intrigued…frozen peas and leeks and everything happens on a sheet pan! So great! I ended up using a large shallow roaster so that I didn’t need to worry about spilling, but this was super tasty and totally workable for a weeknight (especially if you have your leeks cleaned and chopped) – enjoy! Preheat the oven to 400 and pour all of the peas into your roasting pan, followed by the leeks, garlic, vermouth, 2 tablespoons of olive oil, 2 teaspoons of salt and the dill. 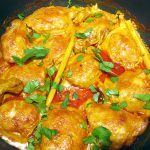 Give it a good stir – with your hands works well – then arrange the chicken, skin side up, on top. Drizzle the chicken with more olive oil and sprinkle generously with salt (and pepper). Roast for 45 minutes. Remove the pan from the oven and give the peas as much of a stir as you can, then put the pan back in the oven and roast for another 30 minutes. 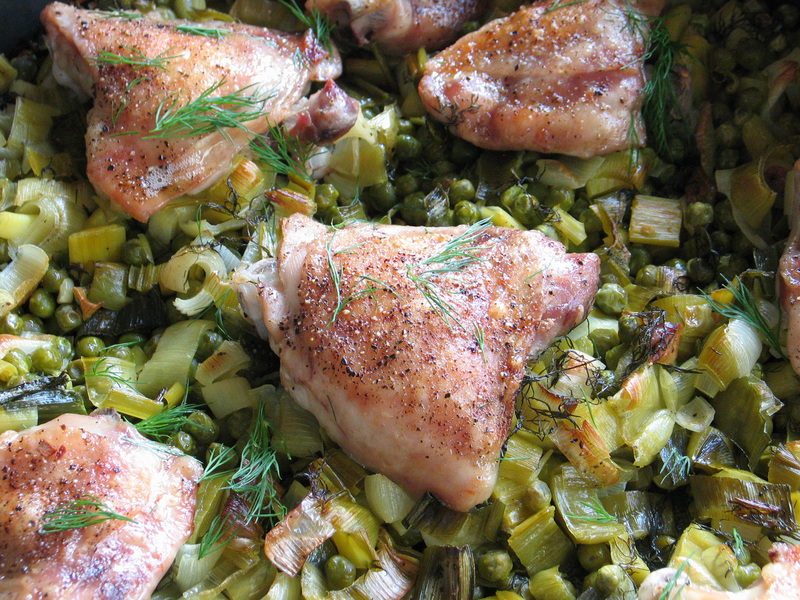 The peas and leeks should be soft, and the chicken should be perfectly golden and crispy. Garnish with more dill and then serve as you wish, we enjoyed ours over some mashed potatoes.